Are you reading for Thanksgiving? Having a plan makes the day a little less harried. Here are some ideas for Thanksgiving Preparations. That's Thanksgiving driving down your street. Luckily, he doesn't have GPS and won't ask for directions, so he'll be driving around for a few minutes more before he actually pulls into your driveway. But in any event, you need to get your Thanksgiving Preparations in gear. If you are hosting, then check your linens to make sure that they are clean and ironed. If you are like me and use your crystal once or twice a year, then you might want to rinse the dust off of them…just saying. Go ahead and set your table. That will give you a sense of what pieces you may need to clean and what pieces you may need to borrow. I absolutely love my Juliska dishes, but I found these brown transferware salad plates at a local thrift store to add just a little something different to my place setting. They weren't expensive and they play so nicely with my white Juliska dishes. I love these little place cards that I found in a cute little store in Columbia, SC while we were ‘college shopping' last month. Do you have your centerpiece planned out and made? How is your candle inventory? I know I need to grab tea lights…but I'm staying away from the 1-hour burn time ones, tired of those things burning out before dinner is over. I didn't realize that there were 4- and 8-hour tea lights, so I just ordered a bag of these...thanks Amazon Prime! Use unique or personal pieces to make your table a reflection of you. This spoon in the Winter Spiced Cranberry Conserve was my baby spoon. I actually prefer it tarnished, so I rarely polish it…love the character of it. Make Turkey Stock for your Gravy. These Marinated Castelvetrano Olives are a great nibble that can be made ahead. I'm serving them in a sugar bowl that I found in a local thrift store. Not only is this Winter Spiced Cranberry Conserve outstanding by the spoonful straight out of the jar on turkey, but it also truly delicious over a wedge of warm brie for the perfect Thanksgiving appetizer. It is served in the creamer that pairs with the sugar bowl. If your turkey is frozen, put it in the refrigerator to defrost. prepare stuffing and refrigerate until ready to be stuffed into turkey or baked separately. with the turkey stock, I can make the gravy earlier in the day and add some drippings from the turkey right before serving. Kate will make the salad. Mom and I will be put the finishing touches to the meal. When you have a plan and can space the chores out, it makes the day just that much more enjoyable. What Thanksgiving Preparations have you made or will make to make Thanksgiving a little more relaxed in your house? What a lovely table! Just me and my husband for Thanksgiving dinner this year, but I will be rolling out the best silver and crystal for our celebration. Also celebrating 46 years of marriage! Happy Thanksgiving to “Thee and Thine”! I am thankful for YOU!! I am so glad you will be pulling out all the stops for your combo 46th Anniversary (!!!!) and Thanksgiving. Congratulations and How blessed you are! And I am so grateful to be counted as one of your blessings! Thank you. In return, I must say that it’s readers like you that keep me going each day, that bring me joy and gratitude for this little business/hobby that I so enjoy. What a beautiful Thanksgiving Table!!! Your recipes look scrumptious! I love your centerpiece and gorgeous vintage dishes! Your ideas and list are fabulous! Aw thanks Janine, appreciate your kind words. We are ready for the big day! I hope your day with your family is delightful as well! Happy Thanksgiving. What a beautiful and festive table setting Lynn, I am sure you will have such a wonderful day, you are so organized, I love that! And I wish I could have some of those pies….it must all be so delicious! Wishing you a wonderful Thanksgiving, Hugs! Thanks for swinging by my friend! We are ready for Thanksgiving, in fact we are celebrating it a day early because my parents have to head out of town so we will be starting our Christmas decorating on Thursday!! Lynn, your table looks perfect! I love the dishes and they pair so well with the brown salad plates. Your recipes also sound wonderful. I do wish we lived closer. We could have so much fun so let’s try to plan something at the lake house, seriously. I hope you and your family have a wonderful Thanksgiving! What a beautiful Thanksgiving Table Lynn! I bet you and your family will enjoy every minute of it!! Love all of your tips on getting all organised. Hey Sam, we will very much enjoy our day of feasting! Thanks for swinging by! Loved so much about this Lynn! Love your sense of humor AND your organization. I need all the reminders and help I can get and this was VERY helpful! So very glad that you found a few useful tidbits! I love reading what works for others too. Thanks for swinging by and Happy Thanksgiving! What an elegant table, it is so pretty. I also loved your list. 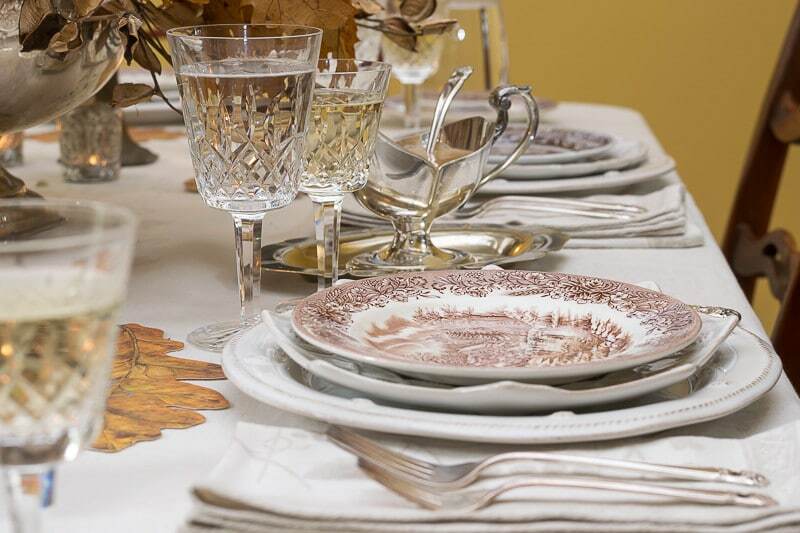 I have hosted Thanksgiving for almost 20 years, but I still collect organizational tips from other hostesses! Your leaf place cards are so cute!! Thanks Kellie…isn’t that true! We figure out what works for us and I love reading what works for others. Thanks for stopping by. Everything looks so beautiful, Lynn. I love your dishes, they match so perfectly! All of your tips are so helpful too. I’ve jotted down a few for this year. I’m having more folks over than I thought and they will be so helpful! Hi Carolann…thanks for stopping by! I hope your Thanksgiving is fantastic! This is so beautiful!!! I love how you shared your daily schedule with us! I have been hosting for many years, but I still get great ideas from others who are organized like you! Thanks so much Kellie…we all have tips that work for us and I always find it so helpful to hear what works for others. Happy Thanksgiving. Such great tips and your table looks beautiful! Love those plates! Lynn, your Thanksgiving table is absolutely gorgeous. Love that brown transfer ware and how fun to use your baby spoon for the cranberry sauce. I can not believe how organized you are with your Thanksgiving list! I hope you have a wonderful Thanksgiving next week!!! 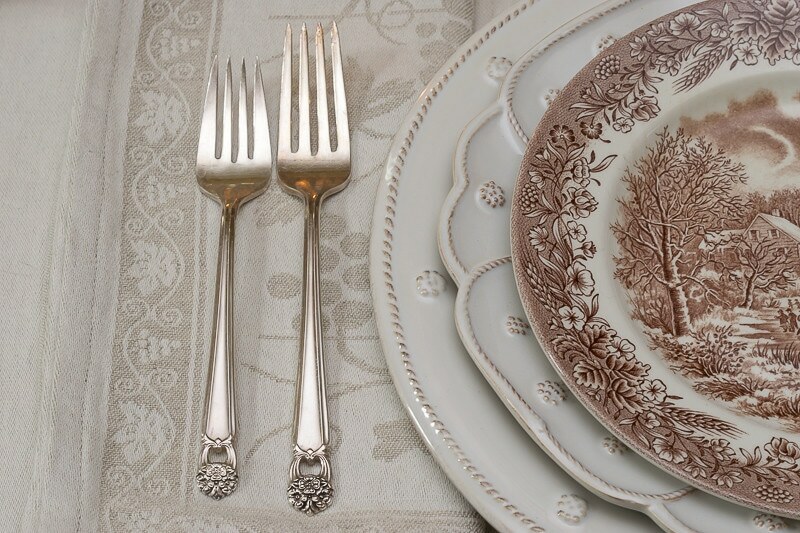 Love your beautiful Thanksgiving table setting! So warm and welcoming! Have a great Thanksgiving. I am dragging my heels slowly preparing for Thanksgiving on Thursday. You have given me inspiration to prepare a pretty table and make everything a little more special. Thank you. C’mon Leslie, you can do it!!! I didn’t get as much done yesterday as I had hoped, and will be out all day today with my Dad, so looks like I’ll be a busy gal tomorrow!